For IELTS Task 1 you may have to describe a physical process. This may be illustrated in the form of a diagram showing the different steps or stages in the process. In a process description some verbs will be in the passive and some in the active. 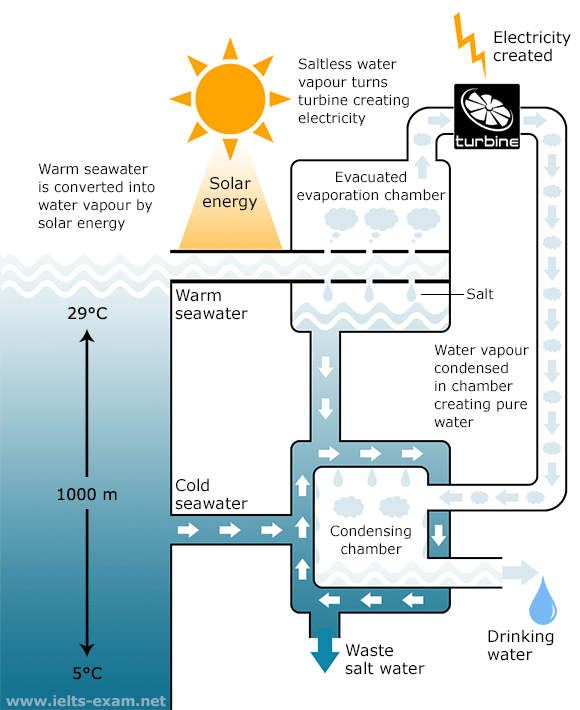 Ocean thermal energy conversion (OTEC) is a system that converts heat energy into the electric power using the temperature difference between surface seawater, which can be up to 29 degrees Celsius, and deep seawater, which is only 5 degrees Celsius. The main components of the system are an evacuated evaporation chamber, a turbine and a condensing chamber. The solar energy of the sun heats up the surface water and this warm water is introduced into the evacuated evaporation chamber, where it boils. As it boils, salt is deposited and water vapour is generated. This vapour then drives a turbine to generate electricity. After it powers the turbine, the water vapour enters the condensing chamber, which is cooled by the water from the depths of the ocean. The water vapour is condensed in this chamber, producing drinking water. Meanwhile, waste salt water is discharged into the ocean and the process can be repeated.